San Francisco: With the popularity of large luxury SUV’s on the wane, it is the smaller, but still substantial midsize crossover vehicles like the Cadillac SRX that are becoming the new choice for many family buyers. Offering much of the utility of an SUV, these tall station wagons are based on car platforms so they ride more comfortably and handle more like sedans. The SRX is no compact, at 4,200 pounds and more than 16 feet long, but it certainly doesn’t feel like a tank on the road. Related somewhat to the sleek mid-sized CTS sedan, the tall wagon SRX zips around town or flies down the freeway nearly effortlessly, but still gives you a third seat option (kids only, please). That third seat folds electrically into the floor, and combined with a flat-folding second seat, adds up to lots of hauling capacity. When my TV died during the SRX’s week with us, we just drove over to Best Buy and loaded a surprisingly large (and heavy) box into the rear compartment. Plus the power rear door rose and closed with the touch of a button. The SRX wears Cadillac’s recent edgy styling, with a bold, confident egg-crate grille up front, like Cadillac’s have flaunted for decades, but flatter and more sharply defined. The aggressive lines of the CTS are upsized for this nearly six-foot-tall rig. The headlamp pods are as big as shoe boxes, with surprisingly massive rectangular turn signals and fog lamps flush mounted below them in the bumper. The tail lamps stand slim and stately along the tailgate, harkening back to the famous fins of yore but much less flamboyantly. This car looks really like a Cadillac and will not be mistaken for a BMW, Acura, or Volvo. To my eye, it may be the best looking Cadillac out there right now. 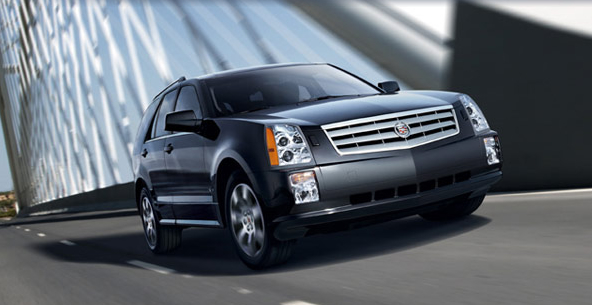 You can have Cadillac’s famous Northstar V8 engine in your SRX if you want to. It boasts 320 horsepower and 315 lb.-ft. of torque, through a six-speed automatic. This particular shifter debuted in the potent V-series sedans, but now it’s standard for V8 models. You can also choose a 3.6-liter V6, which my Light Platinum tester had. You get a vigorous 255 horsepower and 254 lb.-ft. of torque and save in price and fuel economy. Like the V8, the V6 uses today’s high tech features to maximize performance, such as variable valve timing, dual-stage variable intake manifold, electronic throttle control, and more. The V6 uses regular gas, a bit of a savings, considering estimated fuel economy of 16 City, 24 Highway (I averaged 15.8 mpg). New this year is a fresh interior. As luxury cars go Cadillac’s have to be nicer than the ordinary, and with this new passenger compartment, the SRX moves upward. Everything you touch is softer or finer. There is more hand craftsmanship and better materials are everywhere, with rich wood on the steering wheel and dash and a leather and wood steering wheel. I even found a bonus glove box under the wood trim strip on the passenger side. One mystery, I couldn’t find the rear window wiper control. I looked in the owner’s manual and discovered that it was in the ceiling console! Mystery solved! New for 2007 is a Sport package, which offers front and rear fascias, a body-colored mesh grille, large polished dual exhaust tips, the six-speed automatic, and 20-inch sport wheels. This would more likely be the choice for the young guy on the prowl who can’t afford an Escalade than for a soccer mom, but who’s to say? The SRX V6 starts at $36,745, a typical price in this segment. However, like many cars today, you can add a lot to them, so with the wood on the steering wheel, Magnetic Select Ride Control, and the V6 Premium Luxury Collection ($7,150) with its many options, my test car’s price rose to $46,440. One of the more interesting features of the luxury collection is the Ultraview sunroof, which opens up a huge space for first and second row riders. The largest opening roof in the segment, it spans 5.6 square feet and adds a clear window over the third row occupants.